LONDON: 30 JUNE 2016 - The directors of ECR Minerals plc (the “Directors”) are pleased to announce the Company’s unaudited half-yearly results for the six months to 31 March 2016, along with the following update. Since my last report to shareholders, published on 7 March 2016 alongside ECR’s annual financial statements, the Company’s focus has been on the Avoca and Bailieston gold projects in Victoria, Australia, of which ECR’s wholly owned Australian subsidiary Mercator Gold Australia Pty Ltd (“MGA”) has agreed to acquire 100% ownership. MGA is prioritising the Avoca project, where the potential to generate relatively short-term cash flow from the reprocessing of historical waste dumps to extract remnant gold is being evaluated. MGA is well placed to act as the corporate vehicle for this activity, on the basis of its estimated tax losses of approximately AUD 66M as at 30 June 2015, which may be available, subject to certain conditions (as described in the Company’s announcement of 4 December 2015), to reduce MGA’s future taxable profits. Australia has become a more attractive operating environment for gold projects following the substantial depreciation in the Australian dollar against the US dollar which occurred during 2015. The Australian dollar gold price is at close to record highs. In addition, fuel, labour, consultants and other key mining inputs have fallen significantly in price. The acquisition of the Avoca and Bailieston projects represents a strategic shift for ECR towards operations in Australia through MGA, and the plan to establish relatively short-term production at Avoca is a key element of this strategy. 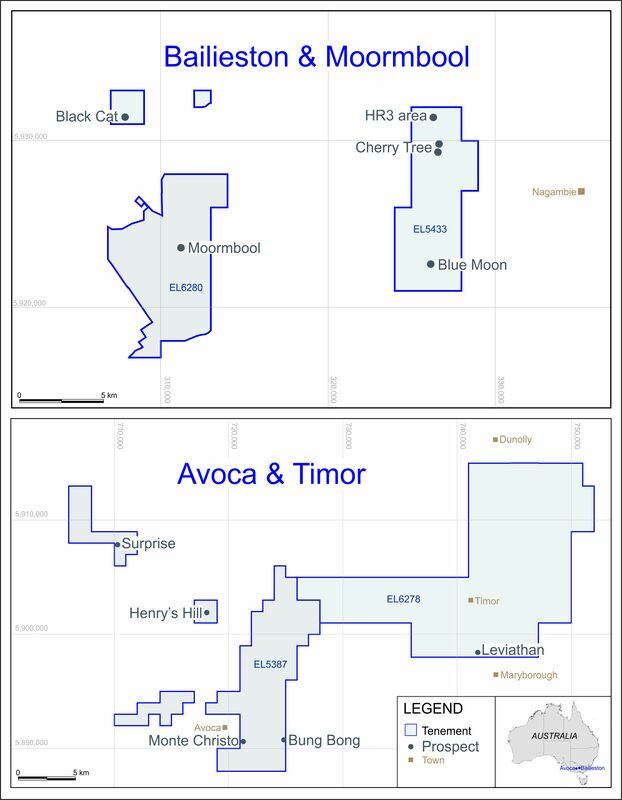 The consideration for the acquisition of the Avoca and Bailieston projects by MGA comprises up to AUD 250,000 in ECR shares (based on certain milestones), and a net profits interest royalty of 20% in respect of mine dumps and 10% in respect of other deposits (royalty capped at AUD 3.5M). The structure of the transaction has the effect of aligning the interests of the vendors with those of MGA/ECR. The acquisition of the projects remains conditional on the necessary Victorian government authorisations and registration of the transfer of the projects to MGA, and on issuance of the Initial Consideration Shares (as defined in the Company’s 3 March 2016 announcement). On 20 April 2016, the Company released a JORC Code-compliant technical report in relation to the Avoca and Bailieston projects (the “CPR”). The CPR was prepared by Mr Jeremy Peters BSc, BEng, FAusIMM CP (Min, Geo), who is employed by Snowden Mining Industry Consultants, and has sufficient experience that is relevant to the style of mineralisation and type of deposit under consideration and to the type of activity being undertaken. The CPR described the history and potential of the two projects in great detail, and determined Exploration Targets for the projects, in accordance with the JORC Code. The Exploration Targets are set out in Table 1 below and have been extracted from the CPR, which is available on the Company’s website (www.ecrminerals.com). ECR confirms it is not aware of any new information or data that materially affects the information included in the original announcement of the Exploration Targets and confirms that the form and context in which the competent person’s findings are presented have not been materially modified from the original announcement. * The ranges of tonnage and grade stated above are conceptual in nature, are not estimates of a Mineral Resource or Ore Reserve, and pertain to mineralisation where there has been insufficient exploration to estimate a Mineral Resource and it is uncertain if further exploration will result in the estimation of a Mineral Resource. The basis on which the above Exploration Targets have been determined is set out in the CPR. ** Conversion of the ranges of tonnage and grade for the “deep lead alluvial” and “waste dumps” Exploration Targets to ounces assumes a specific gravity of 1.5; figures in ounces are rounded to the nearest 500 oz. * Completion of a mineral resource estimate for the dumps, entailing additional augur sampling. The necessary sampling was completed in April 2016. Gold resource estimates encompassing four waste dumps within the Avoca project area have been compiled in draft form, and are being refined with additional data as it becomes available. * Metallurgical testwork on samples from the dumps, with a focus on gravity recovery options. A bulk sample for metallurgical testwork has now been despatched to the laboratory, and testwork results are expected during July 2016. * Preparation of an economic study of the proposed reprocessing of the dumps, setting out the capital requirements and projected returns from the operation, and the timescale which would be required to reach production. Completion of the study is targeted for July 2016. * Rock chip and soil sampling at various prospects within the Bailieston Exploration Licence. A programme of rotary air blast (RAB) percussion drilling at Bailieston had been planned to commence in late June 2016, but has now been deferred until later in the year in order to allow key personnel to concentrate on the Avoca project. Two new Exploration Licences (ELs) have been applied for in Victoria by MGA. One EL application is in the vicinity of the Avoca project, and the other is in the vicinity of the Bailieston project. Both EL applications have been accepted by the Victorian government, and issuance of the ELs, if granted, is expected in the second half of 2016. The EL application in the vicinity of Avoca contains a number of significant historical waste dumps originating from ‘deep lead’ alluvial gold mining activities, as is the case within EL5387 (the EL which currently comprises the Avoca project). Historical production from the main alluvial mines within the area of the new application is reported by the Geological Survey of Victoria to have exceeded 272,000oz gold. MGA’s intention is to assess the suitability of the resulting waste dumps for reprocessing in order to extract remnant gold, and the new EL application can be considered an enlargement of the Avoca project. The Exploration Target in Table 1 above does not take account of the new EL which has been applied for. The EL application near Bailieston is intended to expand MGA’s exploration footprint in the district, which currently hosts two significant producing gold mines (Costerfield and Fosterville) within approximately 30km of the Bailieston project. As announced on 13 June 2016, Cordillera Tiger Gold Resources, Inc. (“Cordillera Tiger”), the holder of the Exploration Permit (the “EP”) comprising the Danglay project, was recently invited by the Philippine Mines & Geosciences Bureau (MGB) to sign the renewed EP in quadruplicate. All signed copies have been returned to the MGB, and ECR expects the final renewed EP to be issued in due course. For the six months ended 31 March 2016 the financial statements of the Company as consolidated with its subsidiaries (the “Group”) record a total comprehensive expense of £533,170, the largest component of which is other administrative expenses of £296,286, which relate primarily to the development of the Company’s projects. The Group reported a total comprehensive expense of £896,320 for the six months ended 31 March 2015. The Group’s net assets were £1,907,983 at 31 March 2016 compared with £4,515,381 at 31 March 2015, primarily reflecting the decision at 30 September 2015 to make an impairment provision against the carrying value of the MGA deferred tax asset. Exploration assets at 31 March 2016 were £2,224,024, versus £1,766,779 at 31 March 2015, reflecting the investments made in the Company’s projects.